This is a guest post by Nick McCullum from Sure Dividend. Sure Dividend uses The 8 Rules of Dividend Investing to systematically identify and rank high-quality dividend growth stocks suitable for long-term investment. term wealth. It can also seem highly complicated to those without experience in this investment strategy. Fortunately, one of the best things about dividend growth investing is its ease of implementation. This makes it well-suited for a wide variety of investors. 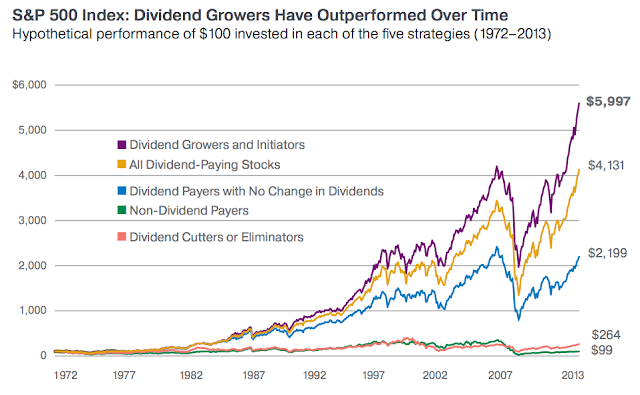 Clearly, something is special about dividend growth investing. With that in mind, this article will describe four easy-to-understand principles that form the blueprint for successful dividend growth investing. There is plenty of academic evidence to show that stocks with consistently rising dividend payments tend to outperform the broader stock market. Identifying stocks with strong dividend growth prospects, however, can be difficult. History is on our side here – dividend history matters. Stocks with long streaks of dividend increases are highly likely to continue increasing their dividends for years to come. You can see the full list of all 51 Dividend Aristocrats here. The Dividend Aristocrats are a great source of evidence to support to benefits of dividend growth stocks because they have widely outperformed the S&P 500 over long periods of time. More specifically, the last decade has seen the Dividend Aristocrats return 10.6% (including reinvested dividends) per year compared to the S&P 500’s total return of 7.7% per year. The Dividend Aristocrats, along with other databases of stocks with long dividend histories like the Dividend Achievers and the Dividend Kings, are excellent places to look for stocks with solid prospects of consistent dividend increases moving forward. One of the most common mistakes that dividend growth investors make is ‘chasing yield’ – the act of blindly investing in high yield dividend growth stocks without adequate research into the underlying business fundamentals. Investors are initially attracted to these high yield stocks by the prospect of generating exceptionally high dividend income, but their expectations are quickly crushed after a too-high dividend yield is reduced by a dividend cut. High yield dividend stocks are not necessarily bad investments. In fact, high yield is preferable, all else being equal. The trouble is that in reality, all else is not equal. In most cases, a higher dividend yield is accompanied by a higher payout ratio – and high payout ratios may indicate that a company’s dividend is unsustainable. The payout ratio expresses (as a percentage) how much of a company’s earnings are paid out as dividend payments. The payout ratio is important because it allows us to assess the risk of a future dividend cut. Historically, stocks that cut their dividend payments have been the worst performers out of all subsets of dividend growth stocks. Chasing high yield dividend stocks can lead to investing in stocks with unsustainable payout ratios, resulting in dividend cuts. Accordingly, keeping an eye on the payout ratios of your investees is a key component of a successful dividend growth investing strategy. Invest in great businesses with strong competitive advantages and shareholder friendly managements trading at fair or better prices. That last part – investing in businesses trading at fair or better prices – is the topic of this section. Even the very best businesses can make terrible investments if their stocks are trading at terribly high valuations. Of these three useful valuation metrics, the most widely-used is the price-to-earnings ratio. The price-to-earnings ratio measures how much an investor is paying for each dollar of underlying corporate earnings. Another interpretation of the price-to-earnings ratio is the amount of years it would take for an investor to be paid back if the company paid out all of its net income as dividends. If a company’s price-to-earnings ratio is below that of its peer group and its long-term historical average, the company will, on average, make an attractive investment. One word of caution should be said for investors looking to analyze companies using the price-to-earnings ratio. It is important to use the earnings metric which most accurately describes the profitability of the underlying business. Accordingly, we recommend using a company’s adjusted earnings-per-share when computing its price-to-earnings ratio. Adjusted earnings-per-share is a metric that backs out one-time accounting charges that may artificially impact a company’s earnings. Examples include restructuring charges, merger- and acquisition-related charges, or foreign exchange fluctuations. Altria’s GAAP earnings-per-share is more than twice as high as its adjusted earnings-per-share, driven by a significant, one-time cash windfall when SAB Miller (which Altria had a 27% stake in) was acquired by Anheuser-Busch Inbev. Clearly, these ‘earnings’ will not be repeated in future years, and should be excluded from the company’s net income when estimating its future earnings potential. Note: Earlier this year, Dividend Growth Investor wrote an insightful article on Altria’s ‘apparent’ undervaluation due to its artificially high GAAP earnings-per-share. I suggest you read it here. Long-term investing has a number of intuitive benefits that dramatically improve one’s likelihood of building wealth through successful dividend growth investing. 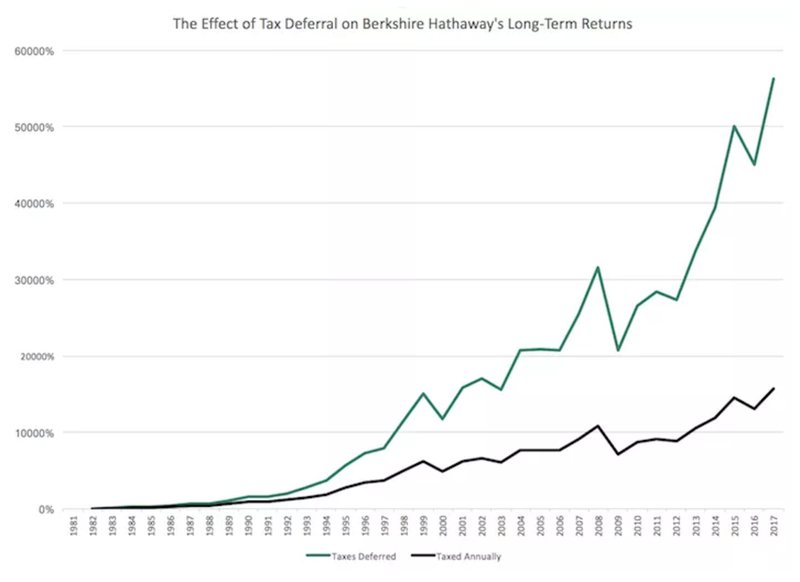 The first advantage to long-term investing is that it is more tax efficient. Stocks held for more than one year are subject to the long-term capital gains tax rate, which is lower than the short-term capital gains tax rate. In addition, investors don’t need to pay taxes on their capital gains until they sell. 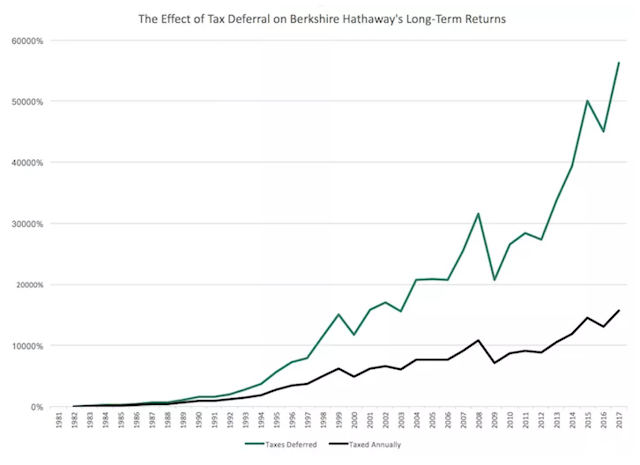 Long-term investing allows us to continually invest those deferred capital gains taxes (which technically belong to the government) for our benefit. This strategy is sometimes called the ‘Buffett Loan’ because of its extensive use by superinvestor Warren Buffett. The comparison of each investor’s total returns is shown below, assuming a 20% long-term capital gains tax rate. The difference is astounding, and provides enough evidence by itself to support long-term investing. Incredibly, there are also two other main benefits to long-term investing. Long-term investing reduces frictional investing costs such as brokerage commissions. While there exist plenty of low-cost stock brokers in today’s investor-friendly world, every dollar spent on brokerage commissions is one dollars that can’t compound for your benefit. Thirdly, long-term investing is easier. When you’re investing on a time frame of years or decades, the day-to-day fluctuations in stock prices suddenly become much less gut-wrenching. You also spend less time on portfolio management, because long-term investing naturally leads to smaller trading volume in the portfolio of an individual investor. Long-term investing is certainly beneficial for investors, but it can be difficult to execute in practice. Having well-defined buy and sell rules helps to manage your portfolio for the long-term. We recommend selling stocks only when they become grossly overvalued (with a normalized price-to-earnings ratio exceeding 40x) or when they cut their dividend. At Sure Dividend, we strongly believe that dividend growth investing is one of the most effective and repeatable strategies for building long-term wealth. This is a belief that we share with the Dividend Growth Investor website. Applying these principles to your own investment strategy should yield dividends (pun intended) for years to come.